Buying, Selling, & Valuing Financial Practices shows you how to complete a sale or acquisition of a financial advisory practice and have both the buyer and seller walk away with the best possible terms. From the first pages of this unique book, buyers and sellers and merger partners will find detailed information that separately addresses each of their needs, issues and concerns. Buying, Selling, & Valuing Financial Practices will ensure that you manage your M&A transaction properly and professionally, aided with the most powerful set of tools available anywhere in the industry, all designed to create a transaction where everyone wins—buyer, seller, and clients. 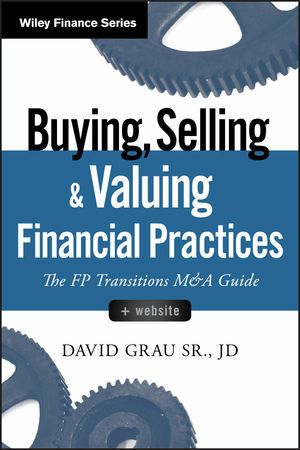 DAVID GRAU SR., JD, is the founder and president of FP Transitions, the preeminent consulting firm known as much for building sustainable businesses as selling or merging them at the end of a career. FP Transitions has valued over 8,000 financial services or advisory practices and businesses, and consulted on over 1,500 completed third-party transactions. Grau Sr. previously authored the bestselling Succession Planning for Financial Advisors: Building an Enduring Business, also published by Wiley. He has written 90 nationally published articles, white papers, and manuals on complex succession strategies, equity management, business continuity, income-perpetuation plans, and mergers and acquisitions. Grau Sr. was named one of the most influential people in the profession in an industry survey by Financial Planning magazine and is a nationally recognized expert on succession planning and business- perpetuation strategies in the financial services industry.